North Shore Community School’s curriculum is based on a national EIC model, using the Environment as an Integrated Context for learning opportunities for students and faculty alike. With EIC, there is an emphasis on connecting the students with nature through an integrated environmental curriculum. The hands on exploration of the natural world at NSCS challenges students to take on small parts of a big question, namely: "What can we learn from the relationships between our community and the natural environment?" 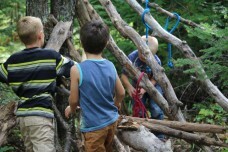 This form of learning draws on children's innate interest in nature and stories of other people. Students encounter frequent opportunities to become strategic thinkers, enthusiastic learners and effective problem solvers. North Shore students apply their growing knowledge base in math, science and writing skills to observe and research their questions. They demonstrate what they have learned to their peers and teachers using their observations - whether spoken, written, drawn, or created using a computer. To enhance and develop a better understanding of various subject matters, experts from Wolf Ridge Environmental Learning Center, the University of Minnesota, and the Minnesota Department of Natural Resources are regularly invited to share their knowledge with students and teachers. Learning at North Shore Community School is cooperative, child-centered, and active. The school’s curriculum is aligned with standards set by the Minnesota Department of Education. These standards can be found on the Minnesota Department of Education’s website. In addition to the core curriculum, students also receive 90 minutes of physical education, 50 minutes of art instruction, 75-90 minutes of music instruction (depending on grade) and 60 minutes of environmental education each week.